Happy Friday! Yay, we made it to the end of the week…TGIF, right?! I’m so excited to be able to have some major progress happening in our kitchen and I hope to be able to share some details about our new window next week. Even when you are hiring projects out, they never go exactly to plan so there had to be modifications. But, I’ll save all of that for another day. Spoiler alert – we love the window though. Back to today’s post. 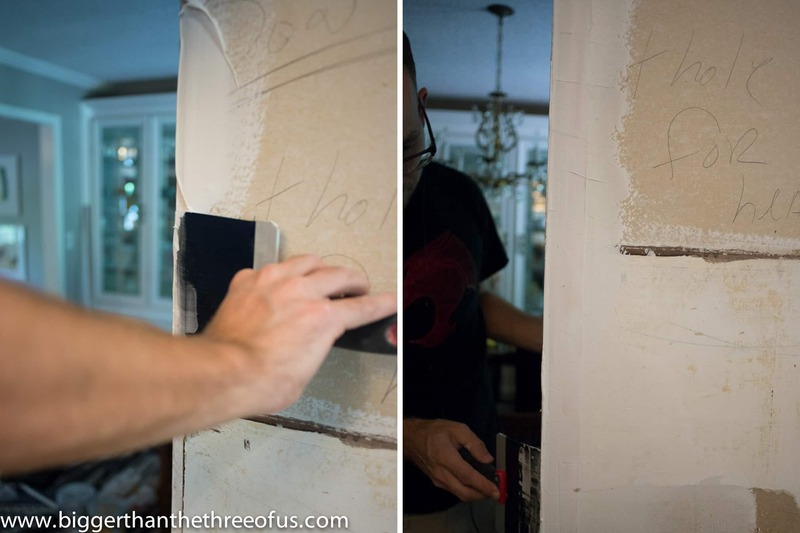 A few weeks ago we shared how to install drywall. 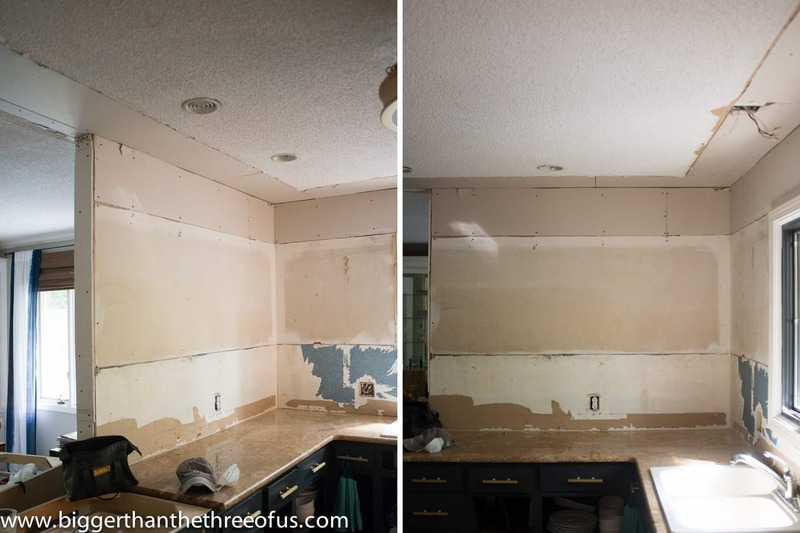 I told you then that we would be back for the second portion of that post on How to Mud Drywall and today is the day. Ok, let’s back up and show you where we started. To help minimize the amount of pictures in this post, I’m going to be referring to this general area. 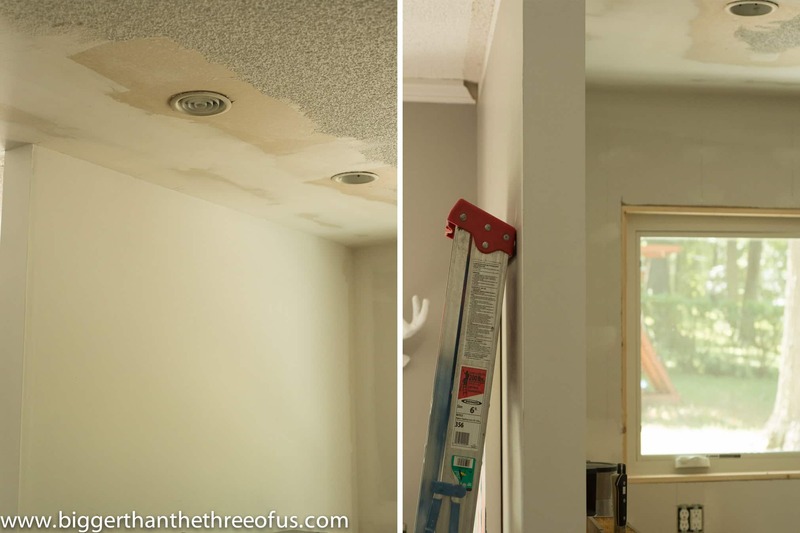 We had two more walls that we had to patch and mud as well as the ceiling where we took the bunkhead down. So, first things first. Gather your supplies. 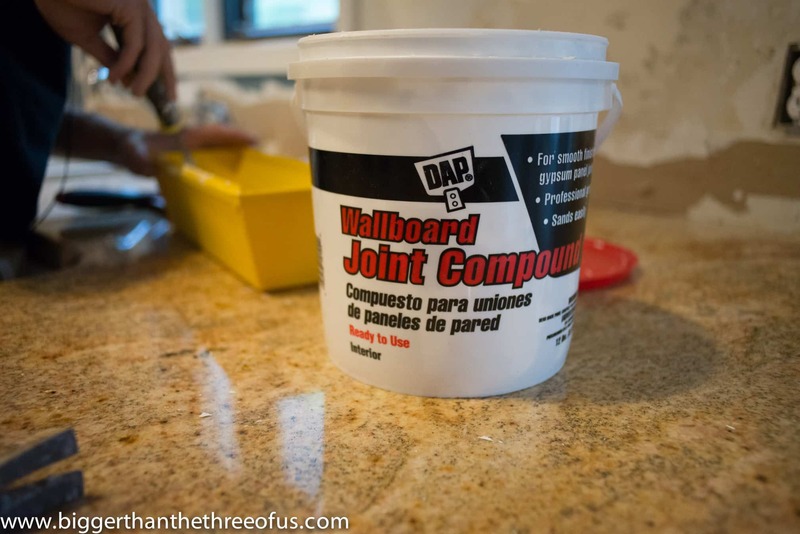 You will need a couple different sizes of taping knifes (we used a 12″ and a 8″), mud pan, joint tape and wallboard joint compound (we chose to buy the premixed buckets but you can mix your joint compound yourself and save money if you’d like to go that route). I know that sounded like a lot of stuff, but no of it should break the bank. The premixed joint compound costs about $15 and it took one whole bucket to do that above wall (ceiling not included). I think we had to buy about five buckets for the whole room. Next, you need to use your 8″ knife and spread the joint compound over your seams (work with one seam at a time). The seam should be completely covered with extra built up on top of it. Once you have spread the mud on your seam, follow the mud with the mesh tape. It usually works best if you focus on setting (pushing in) one end of the tape with your knife and then work from that end down the tape to set the rest of the tape into the mud. After the mesh is applied, go back over the mesh with mud. Then, lightly smooth out the seam to get rid of any big edges. It doesn’t need to be perfect. 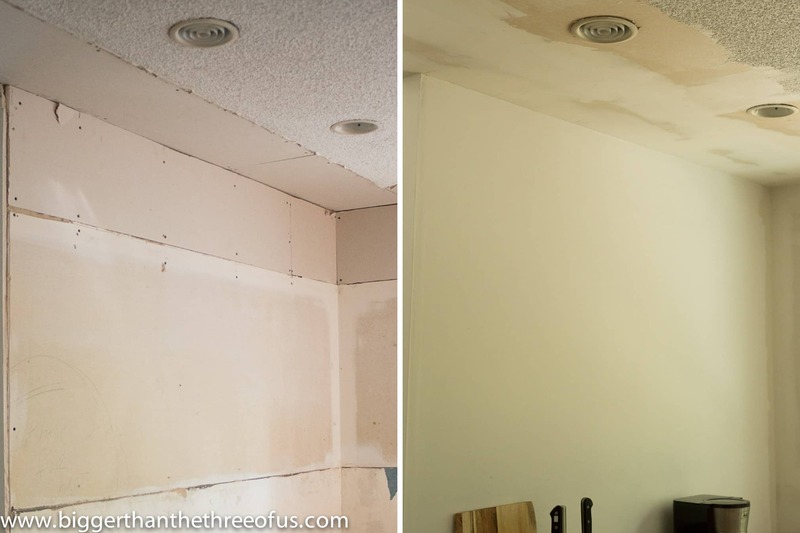 Repeat this process on all drywall seams. You treat corners a bit differently. 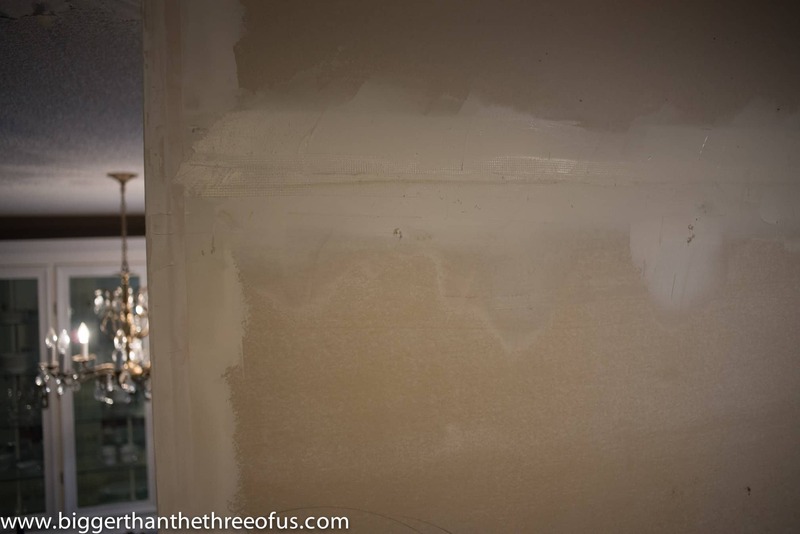 Mud the corners and then place a drywall outside corner bead on the corner. Go back over the corner bead with mud. 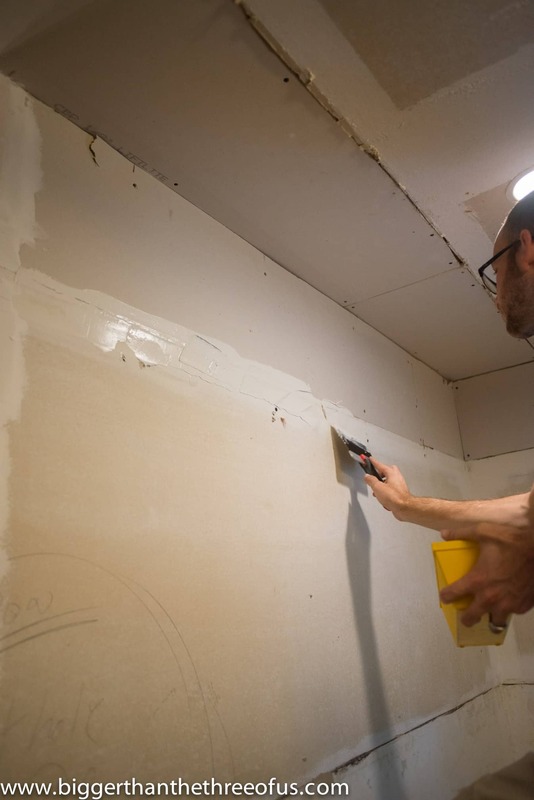 *As with every application of mud, try to smooth and arc so that the drywall looks smooth. This will help with the reapplication process. Once you have applied all the mud, let it dry. Our dry time was 24 hours but they do have some quick set mud if you need to get it done faster. After you have let the mud dry, next you need to sand. Just FYI – this is super messy like messier than anything we have ever done. Take the time and cover your counters with plastic and hang plastic sheeting to help contain the drywall dust. You will thank yourself, promise! 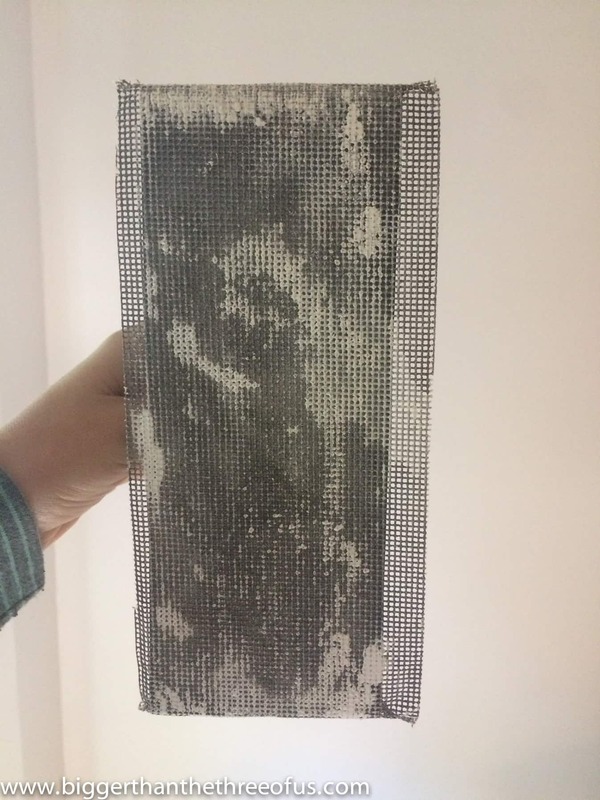 We used a sanding screen (similar to this one). 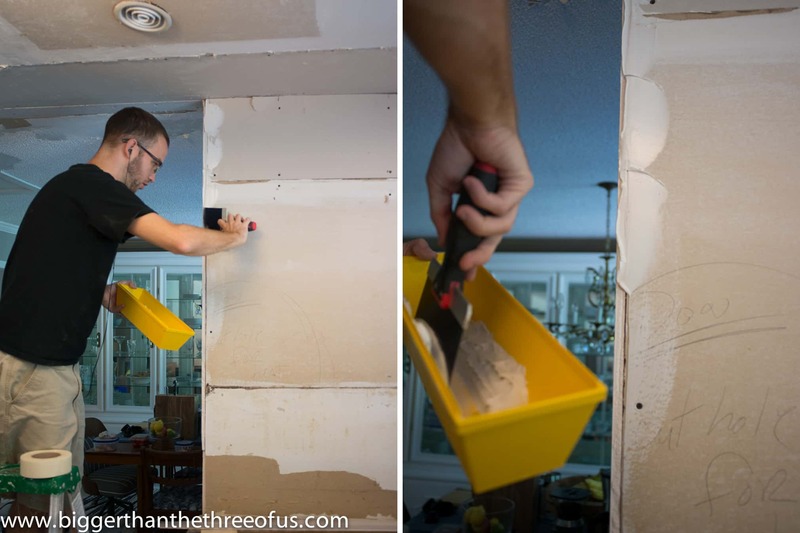 After you have sanded, wipe the loose dust off the walls with a large sponge. Next, we’ll apply the second coat of mud using the 12″ knife. All coats after the first are the same. You just start by applying some mud along the seam, and then use the large knife to gently smooth out the seams and widen the mudded area. 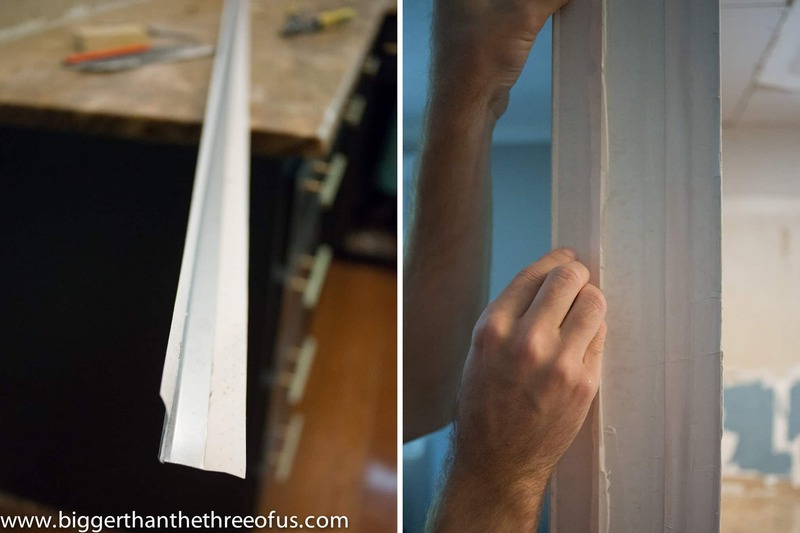 This helps taper out the drywall so it covers the seam well in the middle and then gets thinner and thinner the farther away from the seam you go. Repeat this process until your seams look good. We went three rounds. After the last sanding you can proceed to painting. 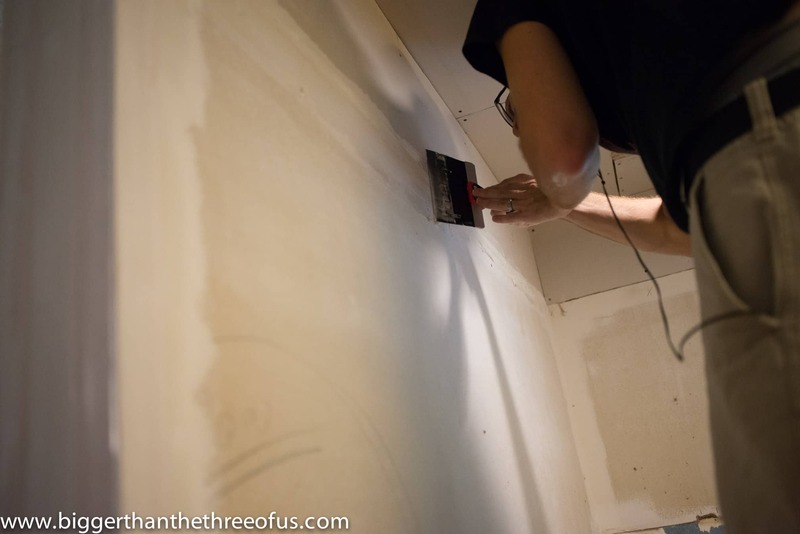 All in all, installing the drywall (check out our tutorial for how to install drywall if you haven’t), and finishing the drywall together are a pretty decent project. It’s definitely a doable project for a DIYer. But, between the install and letting the mud dry between coats; I’d say it’s definitely a two-weekend-type project. 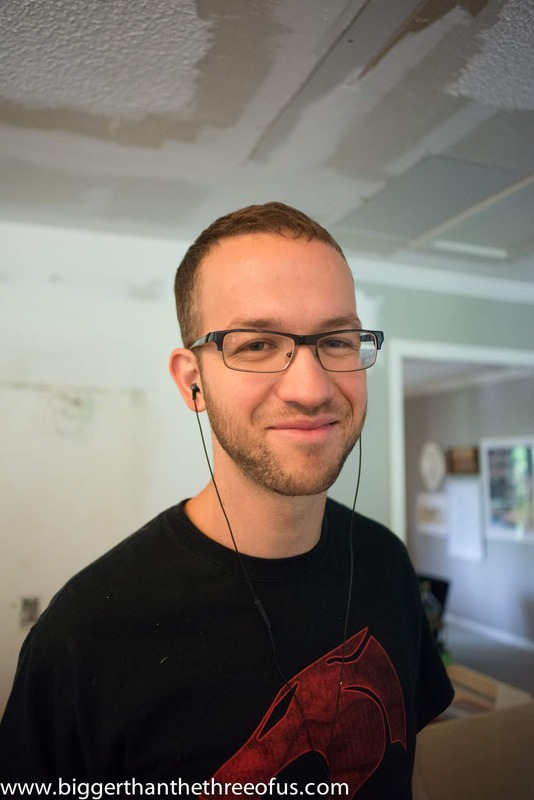 For us, it was more like a 2 month project… but who’s counting? Affiliate links below. Click to read my disclosure policy. We are hoping to finish the trim for our new window (see peek above) soon, but we shall see! Have a great weekend.